Earlier this week, a Bangladesh naval vessel paid a visit to Vietnam. The interaction spotlighted some of the ongoing activity within the defense aspect of the broader relationship between the two Indo-Pacific countries, which has come under increased focus in recent years as they have looked to boost their wider collaboration more generally. While ties between Vietnam and Bangladesh initially developed quite slowly after the establishment of relations in 1973, things have accelerated over the past few years to a certain extent. Dhaka is looking to improve its ties with key East Asian states and also enhance its partnership with ASEAN, while Hanoi is also keen to invest in diversifying its relationships, especially to realize economic and diplomatic gains. Both sides have been developing ties in various areas, including agriculture, fisheries, and cultural exchange. Defense and security collaboration has factored into some of those discussions, even though it has been slower to take off. For instance, last year, when then-Vietnamese President Tran Dai Quang made a three-day state visit to Bangladesh in March in line with the commemoration of the 45th anniversary of diplomatic ties – the first visit by a Vietnamese president in about a decade and a half – both sides agreed to reinforce the security aspect of cooperation further. On April 8, the defense component of the relationship was in the headlines again with a visit by a Bangladeshi naval vessel to Vietnam. 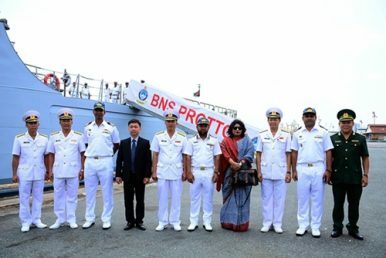 The Bangladesh naval corvette BNS Prottoy (F112) was on a scheduled port visit to Ho Chi Minh City that was to last four days. The visit, which began with the anchoring of the vessel at Saigon Port, consisted of a series of engagements. For one, the crew, which comprised of 23 officers and 116 sailors and was captained by Colonel Mirza Mohammad Mehedi Hassan, paid courtesy visits to leaders of Ho Chi Minh City and Naval Region 2 Command. There were also other cultural and people-to-people components of the visit as well, with sailors of the ship visiting historical and scenic sites in the city and participating in sports events with officers and soldiers from the Naval Region 2 Command. Per the official account of the Vietnamese military, both sides also held discussions and engagements aimed at exchanging experiences in fields of mutual concern – which were not specified. The visit was framed in terms of the intensification of Vietnam-Bangladesh collaboration and the enhancing of mutual trust and understanding between the two militaries and the navy services in particular. Vietnam-Cambodia Military Relations in Focus with Defense Minister VisitNaval Visit Puts Vietnam-Thailand Defense Relations Into FocusVietnam-Thailand Military Ties in the Headlines With Air Force Chief VisitWhat’s Next for Vietnam-New Zealand Military Cooperation?Can Vietnam Get Its Military Out of Business?